Hannie Sarris, doll artist extraordinaire, passed away today. Shockingly sad news, I'm still having trouble processing it. So very talented, so very inspiring. My thoughts go out to her family and all her friends and fans. 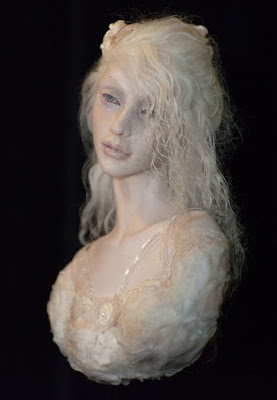 I had no idea...she was one of the most talented doll artist I think I have ever seen. My thoughts and prayers are with her family and friends. Wow, this is so sad :( I really didn't know her but her work is outstanding! Im stunned to hear such awful news....its a tragic and sad loss of such an inspirational and lovely woman. Thanks for posting this dear Sue. She was the icon of the Dutch doll world, the founder of Dabida but most of all..she was the so loved wife of Chris, Mother of their 4 sons and our friend. Her sudden passing hurt so terribly much. I am very saddened by this news. I absolutely love her work. I went to her class site and even placed it on my blogroll because I had hope to travel over to take a class from her. Hannie was probably one of the most talented doll artists I have ever seen. I know it is so sad and so sudden. Hannie and I emailed for awhile and I have several of her wonderful books. I just read this news on Joannas blog. So teribly sad. I didnt know Hannie but her beautiful work has been an inspiration to me and so many of us. where they get their information? I have, except your statement, found no further information in the network. Very sad news. I feel for her family, how unfair can life be. This is so terribly sad. My thoughts go to her husband and sons. Hannie's work is absolutely beautiful. I first saw it over 2 years ago, and regularly checked her site. I managed to buy her fairy book earlier this year. I'm just very sad at this news.